Everyone who knows Mr Main Event knows I is a true hulkamanaic. When Hogan joined the colors I also traded my red and yellow in for black and white. 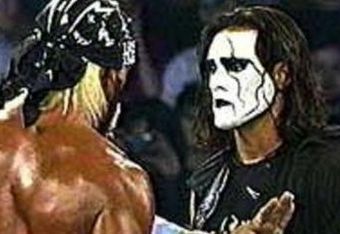 While I was a huge WWE fan growing up I was also a WCW fan and my favorite was Sting. When Hogan arrived I was happy to see these guys working not only in the same company but on the same team at times. As time went on and the boos start to pour towards Hogan he went to the enemy the cancer of WCW, the Outsiders (Scott Hall and Kevin Nash) and they formed the NWO. Once Hogan won the title things started to seem stale. No one in WCW was a match for him. They needed an answer. Who better to call than the man they call Sting? I loved this match. Watching two of my favorites go back and forth was awesome and I will admit I was rooting for Sting. Why, I like title changes...when they make sense. Just when it seemed Hogan would leave Starrcade still World Champion, but after what was originally planned to be a fast count but was botched, another one of my favorites, Bret Hart came out to save the day. After he called for a restart Sting would get the best of hogan and set him up for the Scorpion Deathlock. Hogan tapped and WCW was saved heading into 1998. Ironically that would be the last great year they had. Seeing all the stars come out to celebrate really showed the emotion and passion of these superstars who saw their company saved by a man who had been the face of it so long only to have it snatched away from him when Hulk Hogan arrived. If WCW would have kept Sting and Hogan's feud going longer then they would probably have done way better then what they did.